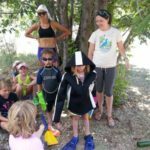 Monday July 22: Beaver Ponds | Mountain Kids! Today was wonderful! 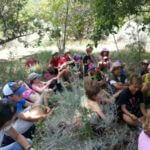 We had a circle to discuss how we all want to act at Mountain Kids (leave no trace, safety first, and having fun)! Each kid traced their hand print on our group contract to show their agreement. Then we headed off to the ponds. 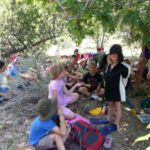 We hiked in and sifted through the ponds looking for aquatic macroinvertebrates. We played games like camouflage and looked at fossils. We saw a red tailed hawk! Then we learned about beavers reading stories, talking about their adaptations, and even dressing two of the kids in beaver costumes! It was a great day.